Want to see more winged beauty? © Copyright 2010 FarmgirlFare.com, the fly by night, nap by day foodie farm blog where poor Serena and her strapping young son have been stuck in a barn pen eating hay for the last two weeks while she's being treated for mastitis (grazing on lush grass promotes milk production—this is no fun for any of us), but Crazy Lazy Daisy and that gorgeous luna moth are hanging out in there by choice. LOL... oh, I do so love pix of Daisy! It looks like she is playing hide and seek! Wow! 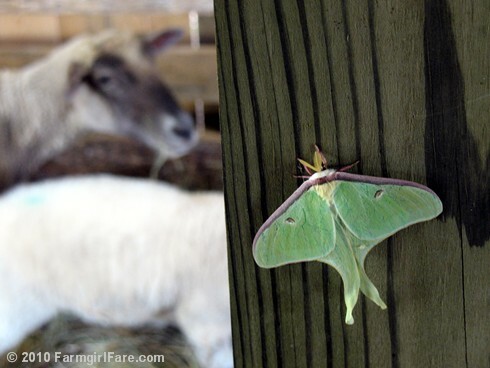 Seeing a luna moth like that! That Daisy--she is such a sweetie and character. Thanks for all your posts. I live in town and miss the country. They make my day! I LOVE Luna Moths. When we go to the cabin on the Gasconade we see them, maybe one a year. Gorgeous. Neat photo of the moth/butterfly! Daisy is my kind of girl, party all night, sleep all day! She's just resting up to party again tonight. I love your stories and pictures. We had a wonderful Great Pyr "Sammy" and miss him to this day. Your pictures bring back so many wonderful memories. Thank you!! By the way Sam came from Missour all the way to Ontario Canada as a gift from a wonderful friend in Troy. Love the photo of the luna with the... sheep? Goats? Beautiful! 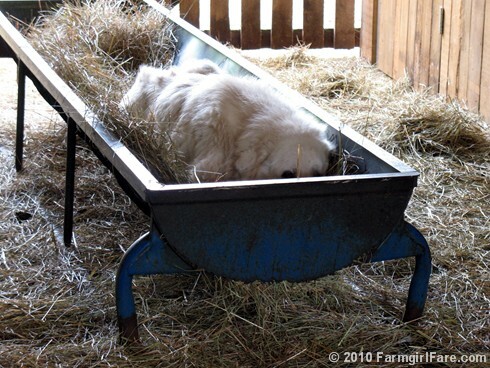 Daisy might want one of those special big dog hammocks that are easy on the bones and very comfy for working dogs.